PORTLAND, ME — Gritty McDuff’s Brewing Company announced today that its highly popular Vacationland Summer Ale will feature new labels and packaging when it arrives in stores this month. Vacationland Summer Ale is the brewer’s third beer to feature a new look — following Gritty’s Original Pub Style and Gritty’s Scottish Ale – since the company began a year-long effort to implement new packaging for its full line of seasonal and year round ales. Gritty’s introduced new packaging for Original Pub Style and Scottish Ale in December 2010. The new packaging is a nod to Gritty’s three brew pubs, their customers, and incorporates subtle details that fans of Gritty’s will recognize and appreciate. 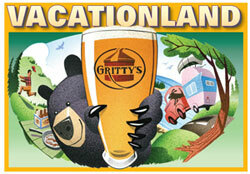 The new Vacationland Summer Ale packages continues that theme, featuring brighter colors, a beer-thieving bear and summer campers traveling through Maine. Vacationland Summer Ale is a full-bodied ale made with generous portions of pale malt and a touch of wheat malt, along with Cascade wheat hops for a delicate and forward hop character. This seasonal ale will be available in 6- and 12- packs of 12- ounce bottles, 22-ounce bottles, 5-liter mini kegs and on draft in bars and restaurants throughout New England.